Below are raw-text notes I took at the education session at State of Play. I’ll write something more coherent when I catch some time. At right you can see Becca and me participating in our own ad-hoc backchannel via Berkman Island. Doug: transferability. Games as terrible environments, not for learning, but for teaching — because gamers are subversive. MMOs as spaces for both real AND the virtual without the two competing. Critical vs. productive disposition: interpretation vs. meeting others’ needs. WoW learning as fusing critical + productive: learning how to process information and build in relation to the specific, personal, and contingent. Where does learning happen: in world, boundaries between wrlds, boundary spaces: forums, guild sites, wikis…). Games are better at setting dispositions than content — consider games and learning, not games and teaching. Lauren: State of Play Academy. How to take advantage of this space to teach law + tech more effectively. Use concept of place to change the kinds of teaching we do. “Distance ed on steroids.” Most of the class participants have never been in a virtual world before class — goal is to bring more people in, not just attract the natives. Add granularity to experiences that students can get — they don’t make commitment and can come to individual classes. Rethinking higher education — how do people learn. In relaunch, reconsidering classes as conversations — teacher has only a short moment to hit 5 bullet points before students start talking back. Greater opportunity for teaching: lots of people in the world with expertise, but not much chance for them to be involved in the educational process. How do we open up for students to learn from people other than professors? Like a next step from blogging — an open conversation opportunity. Aaron: hype has been good for convincing administrators to run with an experiment. Topology of course locales: all-virtual, blended, dedicated sim modules (e.g. roleplay). Echoing Doug, need to give up control — can’t just do a powerpoint. But other extreme: go learn about new media, is too scary. Challenge is to create structure for students and let them go. Things will go wrong — you can invite students to help debug the course. Another challenge of computer literacy — there’s an assumption that younger students are cyborg tech jocks. Use the computer jocks as course assistants — pull aside early. Convince students that it’s OK to use VW as homework assignments. Check out NMC in Second Life + SLED. Also check out earlier work in text-based MUDDs. First question: Games/VW as appropriate for teaching, how to adjust pedagogy? Doug: What can VW’s do uniquely? Those things move away from traditional transfer model. But let’s not celebrate that games can solve all of our problems. Math is a terrible forum for exploratory learning. Lauren: Wouldn’t just transfer regular Stanford class into VW but rather try a different approach. Second question (Becca): When a University wants to start an Island, a problem with GC’s being willing to sign TOS. Third question: Why all this focus on SL — is there something about a fantasy world that puts off teaching? Andy: Tools in SL for building. Why can’t we renegotiate the EULA — must it be institution-to-institution? Does university’s interest in $ get in the way. Fourth question: “Crafting” (in rules) Creation : What is it that you want ppl to learn. How to learn the new craft of teaching? Situated Learning, see Constance’s work @ Wisconsin, Gee @ Wisconsin. Simulation environments for business learning — role-playing power of virtual worlds + data-driven simulation. Lauren: example of flyover rights in There as a way to convey property rights (exploratio). vs. simulation where you can recreate case or facts. (Seems like this is a crucial identification of how virtual simulations take advantage of both role and processing power of computers). Games as no different than other areas of education that aren’t straight knowledge transfer: same kind of resistance. Doug: idea of building stuff is itself a new pedagogy. How do you “feel” about law? Using simulation of acting out scenario of implementing Nazi law on Guernsey Island. But frustrated with drawing the magic circle — is there a solution that VW provides? How to evaluate the learning in that environment? Posted by Gene Koo on Saturday, December 2, 2006, at 12:55 pm. 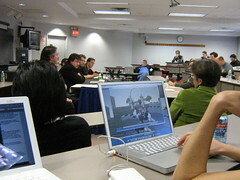 Filed under pedagogy: MUVE, project: CyberOne @ HLS, project: State of Play Academy. Follow any responses to this post with its comments RSS feed. Both comments and trackbacks are currently closed.